California has again sent a message that gender inequality will not be tolerated – this time, in the corporate boardroom. Last weekend, Governor Jerry Brown, in one of his last acts as Governor, signed a bill making California the first state in the nation to require publicly-held companies to keep at least one women on their board of directors. 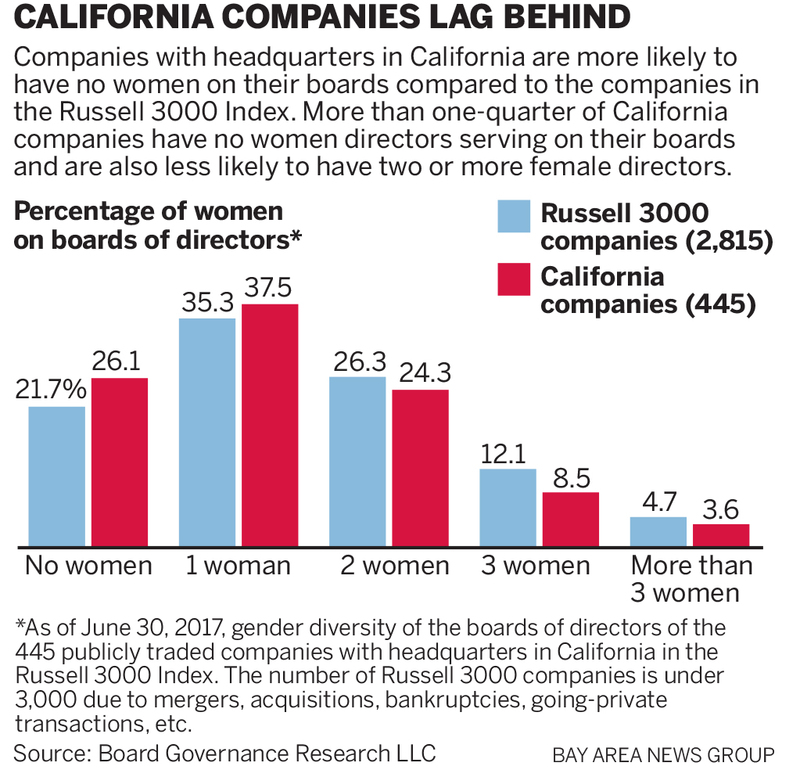 The Bill, SB 826, mandates that all publicly traded California companies have at least one women on their board by the end of 2019, and at least two women on boards with five directors by the end of 2021. While the Bill faces an uphill legal battle, a new survey indicates that many Californians, especially women, support these equality measures, with 95 percent of Californians surveyed agreeing that corporations are not doing enough to add more female directors and 71 percent supporting the Bill itself. Additionally, 98 percent of those surveyed outside of California said they would like to see a similar bill passed in their own states. In a rare occasion, Governor Brown fired a shot at Washington D.C., which is currently immersed in turmoil following the Brett Kavanaugh hearing last week. In a letter copied to the U.S. Senate Committee on the Judiciary, Brown made it clear that the Federal Government was not doing enough to protect women. Governor Brown is right on both points. While California’s message for gender equality is loud, clear, and necessary, the bill may be short lived from a legal perspective. The bill creates a classification based on gender, which raises equal protection issues under the Constitution. If this bill faces a legal challenge, the bill will be subject to heightened scrutiny. In other words, the government must prove that it has a compelling reason for implementing the law and there is no better means of accomplishing that goal. Although the current political and social climate necessitate efforts toward gender equality, it is more likely than not the courts will eventually strike down the legislation. Despite the unclear future of SB 826, the bill should promote equality in the corporate world. Indeed, corporations should want to diversify the leadership of their corporations. Studies show that companies with diverse boards perform better, as they more accurately represent their target demographics. Furthermore, California residents overwhelmingly favor female representation up the corporate ladder. Simply put, it is “high time” corporations get the message about gender equality and take it upon themselves to put women in the corporate boardroom. If you have been unfairly treated in the workplace because of your gender, you may have a case against your employer. For more information about your rights, and a free consultation, please call us at (619) 342-8000.